AMD or Age-related macular degeneration is a deterioration of the eye’s macula (small light-sensitive area in the retina lining the back of the eye). Macula’s main role is allowing you to see fine details clearly. Many elderly people develop some form of macular degeneration as a part of aging process. 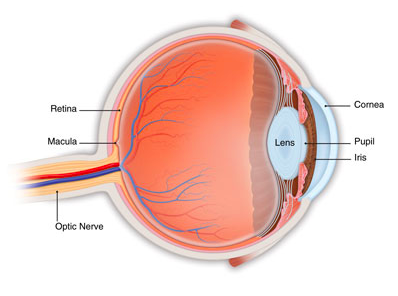 The most common macular problem, however, is AMD. How do you notice AMD? The symptoms are blurriness, dark areas or distortion in central vision and even in some cases permanent loss of central vision. Peripheral vision is usually not impacted. However, cured or uncured, AMD alone almost never causes total blindness. Although its impact on the vision can be small, it still influences the quality of life of a patient. There are two forms of AMD: dry AMD and wet AMD. Dry macular degeneration is a condition which is caused by aging and thinning of the tissues of the macula. With this form, vision loss is usually gradual. It is important that people suffering from this form constantly monitor their central vision – if any change is notices, patient should immediately visit his or hers eye care professional. On the other hand, wet AMD occurs in 10% of cases but it can cause more serious damage. It occurs when abnormal blood vessels start growing underneath the retina. Vision loss from this form of macular degeneration may be faster and more noticeable. First and an obvious one is age. According to American Academy of Ophthalmology large study found that the risk of getting macular degeneration jumps from about 2 percent of middle-aged people in their 50s to nearly 30 percent in people over age 75. Second one is oxidative stress. Over our lifetimes, as a result of this activity, our bodies produce tiny molecules called free radicals. These free radicals affect our cells, sometimes damaging them. It was found that 1 in 3 Caucasians have these genetic changes that are prone to damage from this type of stress. Thirdly, there is heredity factor. People that have a close family member with AMD are at higher risk for developing AMD themselves. Fourthly, smoking, high blood pressure (hypertension) or abnormal cholesterol levels may influence developing advanced (wet) form of AMD. There are some suggestions by research that there is a link between being obese and having early/intermediate stage AMD develop into wet form. Regular eye exams by an eye care professional may help to detect problems or early stages of macular degeneration before you are even aware of them. It is imperative that the tests are performed at every eye exam. For the detection of the dry AMD Amsler grid is used, while the diagnosis of wet AMD usually requires OCT (optical coherence tomography). Next time, we shall talk about treating AMD and some further research being done about AMD.